Morning names from the 9th: a pair you can get stuck in (the Great Grimpen Mire and the La Brea Tar Pits) and the noun duff referring to decaying vegetable matter. Dartmoor is an area of moorland in southern Devon, England [southwestern England, very close to Cornwall]. Protected by National Park status as Dartmoor National Park, it covers 954 square kilometres (368 sq mi). The granite which forms the uplands dates from the Carboniferous Period of geological history. The moorland is capped with many exposed granite hilltops known as tors, providing habitats for Dartmoor wildlife. … Much more rain falls on Dartmoor than in the surrounding lowlands. As much of the national park is covered in thick layers of peat (decaying vegetation), the rain is usually absorbed quickly and distributed slowly, so the moor is rarely dry. 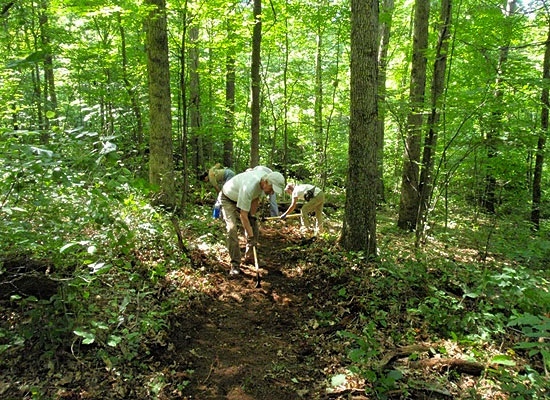 In areas where water accumulates, dangerous bogs or mires can result. Some of these, topped with bright green moss, are known to locals as “feather beds” or “quakers”, because they can shift (or ‘quake’) beneath a person’s feet. Quakers result from sphagnum moss growing over the water that accumulates in the hollows in the granite. 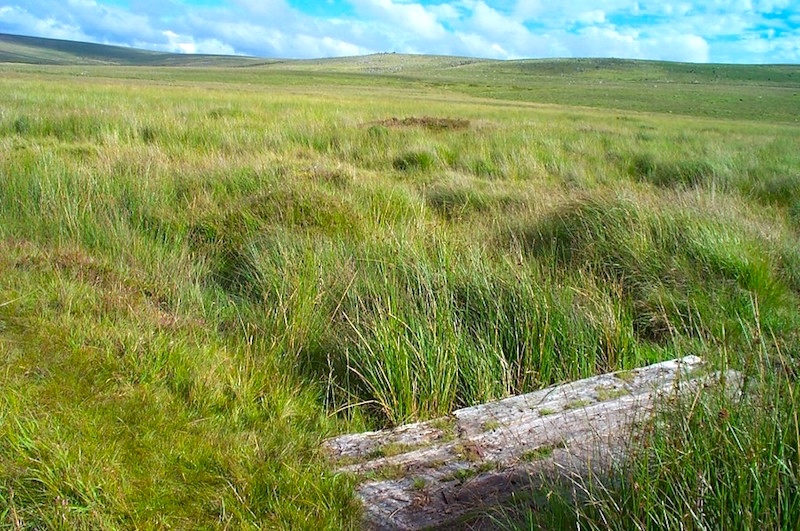 … Some of the bogs on Dartmoor have achieved notoriety. Fox Tor Mire was supposedly the inspiration for Great Grimpen Mire in Conan Doyle’s novel The Hound of the Baskervilles, although there is a waymarked footpath across it. 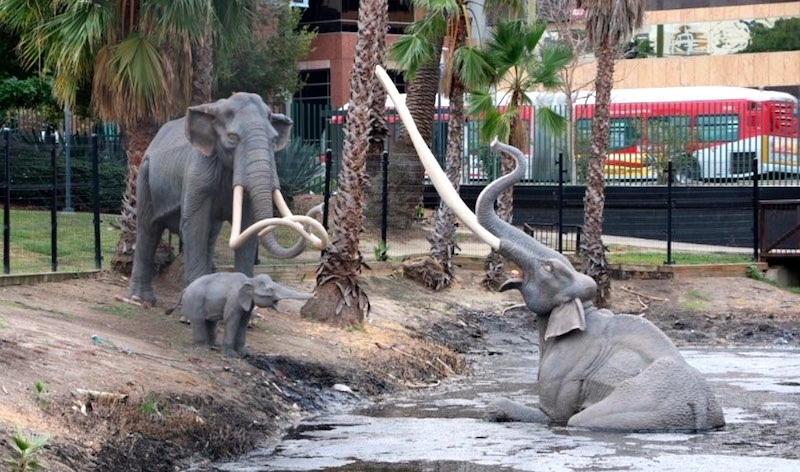 The La Brea Tar Pits are a group of tar pits around which Hancock Park was formed in urban Los Angeles. Natural asphalt (also called asphaltum, bitumen, pitch or tar—brea in Spanish) has seeped up from the ground in this area for tens of thousands of years. The tar is often covered with dust, leaves, or water. Over many centuries, the bones of animals that were trapped in the tar were preserved. The George C. Page Museum is dedicated to researching the tar pits and displaying specimens from the animals that died there. … Among the prehistoric species associated with the La Brea Tar Pits are mammoths, dire wolves, short-faced bears, ground sloths, and the state fossil of California, the saber-toothed cat (Smilodon fatalis). duff 2 noun N. Amer. & Scottish 1 decaying vegetable matter covering the ground under trees. 2 Mining coal dust; dross. adjective Brit. informal of very poor quality: duff lyrics. – incorrect or false: she played a couple of duff notes. ORIGIN late 18th cent. (denoting something worthless): of unknown origin. duff 3 verb [with obj.] Brit. informal 1 (duff someone up) beat someone up. 2 Golf mishit (a shot). ORIGIN early 19th cent. : of uncertain origin; sense 2 is probably a back-formation from duffer1. duff 4 noun N. Amer. informal a person’s buttocks: I did not get where I am today by sitting on my duff. ORIGIN mid 19th cent. : of unknown origin. duff 5 noun (in phrase up the duff) Brit. informal pregnant: it looks like he’s got her up the duff. ORIGIN 1940s (originally Australian): perhaps related to duff1. Sense 4 has figured on this blog before, in the 7/19/15 posting “Protecting fictional brand names”, about Duff Beer on The Simpsons; the tv series plays elaborately on gluteal duff, as in to get off one’s duff. Bianca (Mae Whitman) is enjoying her senior year of high school with two close friends Jess (Skyler Samuels) and Casey (Bianca A. Santos) who are significantly more popular than she is. She is also the neighbor and former childhood friend of Wesley Rush (Robbie Amell), a star on the school’s football team, with whom she had fallen out with during high school. She has a crush on guitar-playing Toby Tucker (Nick Eversman), and reluctantly attends a party hosted by mean-girl Madison Morgan (Bella Thorne), hoping to talk to him. The party turns out to be a disaster for her, as it’s there that Wesley unthinkingly reveals to her that she is the DUFF of her friend group, the Designated Ugly Fat Friend. The DUFF does not actually have to be ugly or fat, he explains, it’s just the person in a social group who is less popular and more accessible than the others in the group. People exploit The DUFF to get to the popular people. This entry was posted on August 12, 2016 at 6:05 pm and is filed under Books, Language and animals, Language and plants, Morning names, Movies and television. You can follow any responses to this entry through the RSS 2.0 feed. You can leave a response, or trackback from your own site.